Maurice Paul Auguste Charles Fabry (11 June 1867 - 11 December 1945) was a French physicist. He discovered the ozone layer in 1913. In optics, he discovered an explanation for the phenomenon of interference fringes. He contributed to inventing the Fabry-Perot interferometer. A. Charlois discovered asteroid #311 Claudia. Charles Lindbergh received the first Distinguished Flying Cross ever awarded. The first manned rocket-powered aircraft flight was made by Friedrich Stamer, in Germany. A rocket-boosted glider was flown by Friedrich Stamer from the Rhoen Mountains in Western Germany on 11 June 1928. The development was funded by Opel, the canard-layout glider designed by Hans Lippisch, and the powder rockets developed by Sander. As in the Opel ground vehicles, a boost rocket (360 kgf for 3 seconds) was used to accelerate the glider down the launch ramp. A sustainer rocket (20 kgf for 30 seconds) kept the aircraft in flight. It was hoped to develop a method of launching gliders that would allow the pilot to get airborne without assistance - one that did not require a tow aircraft or the eight-man crew needed to pull back the rubber band on existing rail launchers. Tests with smaller motors in models showed the high-thrust motors were too powerful, so the full-scale tests used a standard rubber-band rail launcher with only the low thrust motors installed. After two attempted flights, Stamer finally made a successful flight, firing two 20 kgf motors one after the other. The glider flew about 1.5 km in 70 seconds. On the second flight the first motor exploded, setting the aircraft on fire. Stamer landed successfully but further attempts were abandoned. G. Neujmin discovered asteroid #1147 Stavropolis. E. Delporte discovered asteroid #1222 Tina. The first flight of B-52 Tail Number 008 was made, which NASA used as an air launch carrier and research aircraft platform on a long series of research projects. NASA B-52, Tail Number 008, was an air launch carrier aircraft, "mothership," as well as a research aircraft platform used on a variety of research projects. 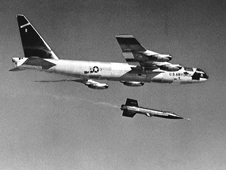 The aircraft, a "B" model, was first flown on 11 June 1955, was the oldest B-52 in flying status at the time of its retirement, and was used on some of the most significant research projects in aerospace history. Some of the important projects supported by B-52 008 include the X-15, the lifting bodies, HiMAT (highly maneuverable aircraft technology), Pegasus, validation of parachute systems developed for the space shuttle program (solid-rocket-booster recovery system and the orbiter drag chute system), and the X-38. NASA 008 was formally retired on 17 December 2004 in a joint NASA and US Air Force ceremony and returned to the Air Force. It is now on permanent public display near the north gate of Edwards Air Force Base. NASA's SOLRAD 10 experienced a core memory failure, resulting in SOLRAD 9 being pressed back into service. SOLRAD 10 (also known as SOLRAD 10 or Solar Explorer C), launched 8 July 1971, was a spin stabilized satellite, one of the SOLRAD series designed to provide continuous coverage of wavelength and intensity changes in solar radiation in the UV, soft, and hard X-ray regions. SOLRAD 10 also mapped the celestial sphere using a high-sensitivity X-ray detector. The spacecraft was a 12-sided cylinder 76 cm in diameter and 58 cm in height. Four symmetrically placed 17.8 by 53.3 cm solar cell panels, hinged at the central section of the structure, served as the elements of a turnstile antenna system. Eighteen solar sensors were mounted pointing parallel to the spin axis of the satellite, which pointed directly at the solar disk. The plane of rotation shifted about 1 deg/day so that a stellar detector mounted to point radially outward from the axis scanned the celestial sphere. Data from all detectors were stored in a 54 KB core memory and telemetered on command to the NRL tracking station at Blossom Point, Maryland. Data were also transmitted in real time at 137.710 MHz. The SOLRAD 10 core memory failed 11 June 1973, and SOLRAD 9 was heavily used until 25 February 1974, when the gas supply of the attitude control system was exhausted. Lacking attitude control, SOLRAD 9 was operationally useless and was turned off. E. Bowell discovered asteroid #2531 Cambridge; and C. Shoemaker discovered asteroids #2459 Spellmann, #2511 Patterson and #2614 Torrence. The USSR Vega 1 descent craft landed on Venus after releasing a balloon aerostat during its descent through the atmosphere. The Vega mission combined a Venus swingby and a Comet Halley flyby by two identical spacecraft, Vega 1 and Vega 2, which were launched 15 December 1984 and 21 December 1984, respectively. After carrying Venus entry probes to the vicinity of Venus on 11 and 15 June 1985, respectively, the two spacecraft used Venus' gravity to get speed boosts to intercept Comet Halley. The first spacecraft encountered Comet Halley on 6 March 1986, and the second three days later. The flyby velocity was 77.7 km/s. Although the spacecraft could be targeted with a precision of 100 km, the position of the spacecraft relative to the comet nucleus was estimated to be known only to within a few thousand kilometers because of variations in the comet's orbit. This, together with the problem of dust protection, led to estimated flyby distances of 10,000 km for the first spacecraft and 3000 km for the second. Data were taken from 2.5 hours before through 0.5 hours after the closest approaches, with several periods of data taking before and after, each lasting about 2 hours. The Venus instrumentation packages each consisted of a sphere 240 cm in diameter, which separated from the spacecraft bus two days before arrival at Venus and entered the planet's atmosphere on an inclined path, without active maneuvers, as was done on previous Venera missions. The lander probes (identical to those of Venera 9 through 14) had two objectives, the study of the atmosphere and the study of the superficial crust. In addition to temperature and pressure measuring instruments, the descent probes carried a UV spectrometer for measurement of minor atmospheric constituents, an instrument dedicated to measurement of the concentration of H2O, and other instruments for determination of the chemical composition of the condensed phase: a gas-phase chromatograph; an X-ray spectrometer observing the fluorescence of grains or drops; and a mass spectrograph measuring the chemical composition of the grains or drops. The X-ray spectrometer separated the grains according to their sizes using a laser imaging device, while the mass spectrograph separated them according to their sizes using an aerodynamical inertial separator. A toroidal system similar to that on Veneras 13 and 14 was designed to absorb shock on landing. After landing, a small surface sample near the probe was to be analyzed by gamma spectroscopy and X-ray fluorescence. The UV spectrometer, the mass spectrograph, and the pressure- and temperature-measuring instruments were developed in cooperation between French and Soviet investigators. After separation, the Vega 1 lander entered the Venus atmosphere on 11 June 1985 at 01:59:49 UT at 10.75 km/s with an entry angle of 18.23 degrees. The pilot parachute was deployed at 02:00:27 UT at an altitude of 65 km and the braking parachute opened 11 seconds later at 64.5 km. The upper heat protection hemisphere was released at that time and the lower hemisphere 4 seconds later at 64.2 km. The upper hemisphere contained the deployment system for the balloon aerostat. The parachute was released at 02:09:37 at 47 km, after which the lander used aerobraking to descend through the thick Venus atmosphere, with drag devices minimizing vibrations and spin and providing stability. At an altitude of 18 km a mechanical shock of unknown origin (possibly due to a jammed valve in an upper compartment suddenly releasing) triggered a ground-contact accelerometer which caused early deployment of the soil drill of the X-ray flourescence spectrometer. The drill was rendered unusable at landing due to the premature deployment. The lander touched down at 03:02:54 UT on 11 June 1985 at 7.5 N, 177.7 E, just north of eastern Aphrodite Terra. The altitude of the touchdown site was 0.6 km below the planetary mean radius, the measured pressure at the landing site was 95 atm and the temperature was 740 K.
After separation, the Vega 2 lander entered the Venus atmosphere on 15 June 1985 at 01:59:30 UT at 10.80 km/s with an entry angle of 19.08 degrees. The pilot parachute was deployed at 02:00:05 UT at an altitude of 65 km and the braking parachute opened 11 seconds later at 64.5 km. The upper heat protection hemisphere was released at that time and the lower hemisphere 4 seconds later at 64.2 km. The upper hemisphere contained the deployment system for the balloon aerostat. The parachute was released at 02:09:15 at 47 km, after which the lander used aerobraking while descending through the thick Venus atmosphere, with drag devices minimizing vibrations and spin and providing stability. The lander touched down at 03:00:50 UT on 15 June 1985 at 8.5 S, 164.5 E, in eastern Aphrodite Terra. The altitude of the touchdown site was 0.1 km above the planetary mean radius, and the measured pressure and temperature at the landing site were 91 atm and 736 K. The surface sample was found to be an anorthosite-troctolite. In addition to the lander probes, constant-pressure instrumented balloon aerostats were deployed immediately after entry into the atmosphere at an altitude of 54 km. Each 3.4 meter diameter balloon supported a total mass of 25 kg, including a 5 kg payload that hung suspended 12 meters below the balloon. It floated at approximately 50 km altitude in the middle, most active layer of the Venus three-tiered cloud system. Data from the balloon instruments were transmitted directly to Earth for the lifetime of the mission. Onboard instruments were to measure temperature, pressure, vertical wind velocity, and visibility (density of local aerosols). Very long baseline interferometry was used to track the motion of the balloon to provide the wind velocity in the clouds. Tracking was done by a 6 station network on Soviet territory and by a network of 12 stations distributed world-wide (organized by France and the NASA Deep Space Network). The balloons measured downward gusts of 1 meter/s and showed horizontal wind velocities up to 240 km/hr. After two days and 9000 km, the balloons entered the dayside of Venus where they expanded and burst due to solar heating. The ESA probe Cassini-Huygens made its closest flyby of Saturn's moon Phoebe. - Academic or personal-use citations must refer to http://L5Development.com as their source.